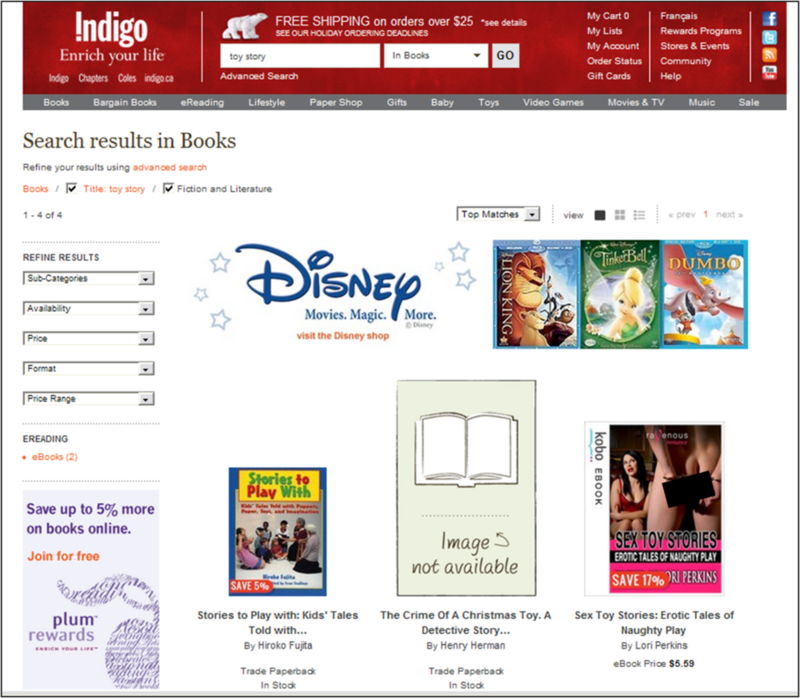 Chapters FAIL: No that’s NOT what I meant by “Toy Story”. I’m not easily offended. At all. I’m not a fan of censorship, drug and I certainly don’t write a lot of hate letters about stuff that offends my tender sensibilities. But I do have three young kids. And while I do want them to learn about the world in all of its complexity and strangeness – really I do – I kind of had in mind a gradual unfolding of knowledge. You know, recipe like introduce the really ugly and complicated stuff gradually? So today while I was looking for Christmas presents my 5 year old son might be interested in, I entered “Toy Story, Books, Fiction & Literature” and as you might imagine, this is what I was looking for. The title of that “eBook” in the corner is “S*x Toy Stories: Er*tic Tales of Naughty Pl*y” (letters changed to keep me out of weirdo searches). And I gotta admit, I was a bit taken aback by the fact that this image and title would appear on the same page as Buzz and Woody… GAH I take that back! See what you made me do there Chapters?!? Okay, I don’t care what the story is about, the title sounds WRONG. Like evil, pathological criminal wrong. And even if the title is misleading and the story is about rainbows and butterflies, the title is enough to make me want to run screaming from the site. And what’s worse, there’s no way to flag it for Chapters. I get that people can self-publish their Kindle books, and that bad people will want to put sick stuff on the Toy Story page during the Christmas rush. Fine. But nowhere on the page is there even a “Hide” button, or a “Flag this as inappropriate content” link so I can help Chapters get better at filtering their stuff for me. So Chapters, just thought you should know, you lost a customer today. Let me know when you fix that and I *might* just come back.